5 bedrooms, 3 bathrooms, sleeps 12! 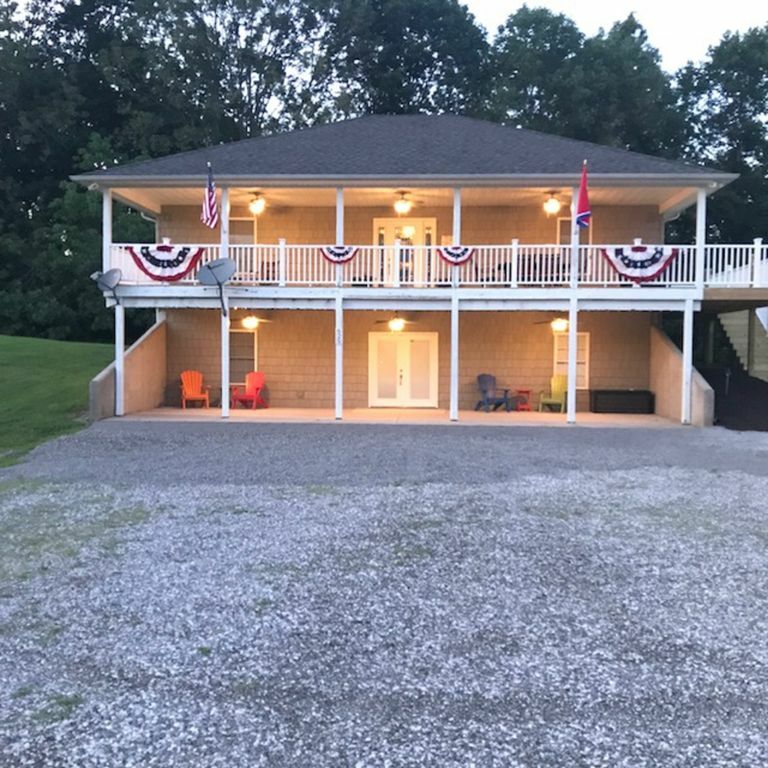 Whether you are here to experience Dale Hollow Lake for the first time or have been coming for years, you can unwind off the grid! Welcome to 625 Frisco Lane, a spacious home 1.5 miles (4 minutes) from Sunset Marina, within walking distance to the Shaved Ice stand off of Rt. 111. This vacation home features new furnishings, linens, and all the conveniences of home with a few personal touches. The kitchen is well stocked for preparing meals large and small. Enjoy dinner inside or outside on the deck with a large deck table and chairs for your family. We have recently added a Blackstone grill with tools and a regular gas grill with tools. With an over-sized chair in the main living room with an extra large sofa, the ultra comfortable living room may be the main hub for conversation, TV viewing, and relaxation among friends and family. The first bedroom is a king master suite/en-suite full bath with tub and shower, sink and plenty of drawers to store your essentials. The other 4 bedrooms are queen beds with 2 additional bathrooms. There is large living areas on each floor, with 2 large screen TV's & a 3rd TV in the master bedroom. The sofa on the lower level is a queen sleeper with a temperpedic mattress. The kitchen has a double full-size oven, 5 burner electric stove, dishes, silverware, coffee makers, pots, pans, blender, crock pot, air fryer and much more. Outside there is a gas grill and a Blackstone grill with the tools. With two levels of decks with furniture for outside dining and entertaining. There are plenty of places to eat nearby and the state park has a boat launch and we provide a pass so you can launch your boat or other lake toys at no cost. We have WIFI, Dish Network. DVD players, games for those who may get bored or those rainy days. We allow up to 2 dogs with permission. There is no smoking inside and we no smoking on the decks. Also, no chewing tobacco is permitted in the house or on the decks. Plenty of parking, so bring your lake toys. All linens provided. All you need to do is bring yourself and your lake toys and enjoy the home and lake. Why should we rent this property? We have priced it so a family can enjoy a wonderful vacation and have everything they need while staying with us. Allowing dogs has always been a priority for us, we have 2 black labs that are our babies and we couldn't imagine not allowing others to bring their dogs. Sorry cat owners, no cats allowed. The birds in the morning have the most beautiful sound, deer run around the property. There is plenty of parking for cars, boats and other lake toys! WIFI and Dish Network, DVD players, games and more! Plus listening to the boats on the water sitting on the deck is an awesome sound! We love horsepower, so when the big boys are out there, there is nothing like that sound. In the late fall, winter and early spring you can see a bit of the lake from the left side of the deck. Sunset Marina 1.5 miles, Star Point Marina 8 miles, 15 minutes away. Seasonal lake views to the left in the late fall, winter and spring, before the leaves are on the trees! Everything you could imagine and some! Dining area off kitchen and 4 bar stools to kitchen counter top. There is also a table leaf & 2 extra chairs in the queen bedroom on the main level. I have brought some of my personal collection of books. Please be gentle with them and leave then where you found them. One of a kind home provided to you with all the bells and whistles. Up to 2 dogs are permitted with prior approval. Pets require up to date veterinary records. Pets are not permitted on furniture. Please see rental agreement for specific information regarding pets. The house is very acomadating and beautiful setting. I throughly enjoyed our stay at your house. Everything was perfect for our whole family. We will definitely recommend it to everyone. Thank you so much for the nice review. We try to make our home your home when you stay. Thank you for recommending it to others. Our family stayed at this lovely home for Thanksgiving. We frequent many homes for vacations and this home is one we loved making memories in. The location is great! We visited the nearby lake and state parks and loved being outdoors. As for the home itself, we were extremely impressed with the quality cooking utensils and cookware, the supplies and the coziness of the home. The only minor "issue" was that it took a while for the downstairs level to get warm. It was very cold outdoors and the heating system took more than a day with the temp set such that it would make the space warm and comfortable. Overall, though, everything else was spectacular!!! Thank you for the wonderful response. We wanted to be sure people who stayed with us had the best of everything. I joking told my husband the kitchen was set up better than our current home! We didn't think we would get many folks staying with us in the winter months, but have remedied the thermostat situation so hopefully it won't take as long for the downstairs to heat up. Also with part of the home being below grade it stays cool, we have the same issue with our home in Maryland. As it was with our first stay here the house was very clean and well stocked. We will be back again for sure. Thank you for coming back and staying with us again! We look forward to future stays! Glad that you found everything just right for your family. Our goal is to make sure everyone has what they need! Beautiful home furnished with everything in a perfect location! Beautiful home that is furnished perfectly with everything and more! Definitely now one of our favorite places to stay, and one of the closest we have found to Sunset Marina! We will definitely go back! Thanks Brian. You're right, you can't get too much closer to Sunset without staying at the marina itself. Glad your family enjoyed their stay with us. Thanks for taking great care of the house, we truly appreciate clients who take care of it as if it their own. Thanks for a great stay!!!! This place was more than we expected. By far the best place we have ever rented. The house is fully stocked as we didn’t need anything at all. The owners were great and very responsive if we had any questions. They made sure we didn’t need anything and all was great. We will definitely be going back again. Can’t say enough about this rental. We loved it!!!! Thank you! We were happy to have you and your family. It was our intention for you to have everything you needed. We appreciated the call about the decorative shower curtain and it has been corrected. And thanks for watering the flowers for us. We loved having you as our guests and we hope you come back again.